A bat mitzvah at the synagogue means we don't have the cook for Friday or Saturday. Which means, I just get to back to bake. 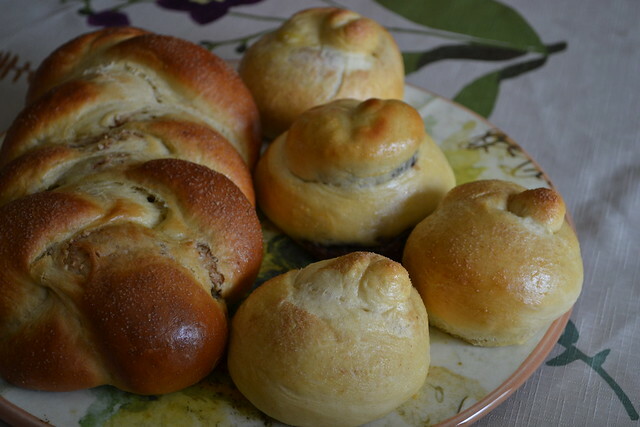 To bake for nosh. To bake for fun. Joy. I made a Almond Cinnamon Sugar Challah in braided and round, a round Nutella, and two plain with cinnamon sugar on top rolls. I'm going to admit it: one of the rolls has already been eaten since I took this photo. Nom. Nom nom nom. Wow... I am SO glad I discovered this blog! 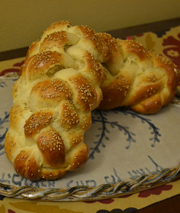 I bake challah (and ordinary bread) a lot and would love to get some new inspiration. Thanks for sharing!